Buff card cover only. 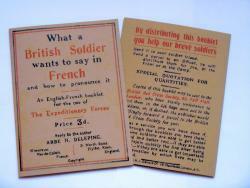 (4"x5") Red / black print - "An English-French booklet for use of the Expeditionary Force". A lot of information on the rear cover regarding the British Red Cross Society, etc.